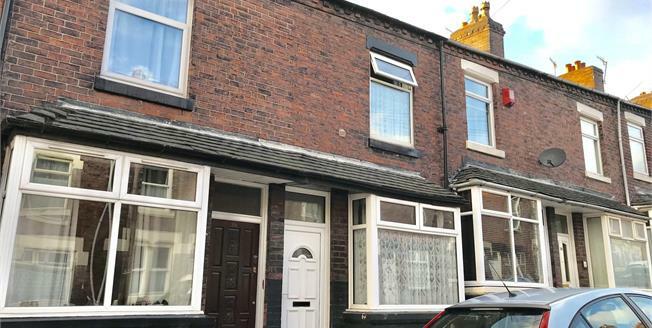 This well presented mid terraced property is conveniently positioned for access to a variety of local amenities, schools and commuter links. The property is currently tenanted until 24/03/2018. The well planned accommodation comprises: dining room, lounge, fitted kitchen, lobby and ground floor bathroom. To the first floor there are two double bedrooms. The property enjoys gas central heating and double glazing and has a generous enclosed yard to the rear. Double glazed window, radiator, light point, front entrance door. Storage closet under the stairs, feature fireplace, double glazed window, radiator, light point. Range of units at eye and base level, roll edge work surface over housing a one and a half sink ad drainer with tiled splash backs. Gas hob, electric oven with extractor hood above. Space and plumbing for appliances, wall mounted boiler, light point. Panelled bath with shower attachment tap, pedestal wash hand basin, low level WC, double glazed window, radiator, light point. Double glazed window, radiator, light point, wardrobe over the stairs.